You are here: Home / News / Could your dog or cat be suffering? Could your dog or cat be suffering? 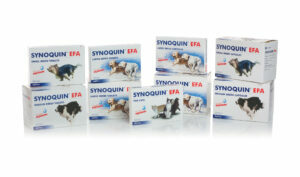 FREE arthritis checks and 33% off Synoquin joint supplements for the month of April!! We all know arthritis is a painful and joint stiffening condition, but could you tell if your cat or dog had the same problem? Signs in Cats and Dogs. Older pets may limp, be stiff when they first get up, struggle to get up steps or jump into a car. Cats may have trouble getting into litter trays which can lead to them urinating or defaecating in unusual places. We assume our pets ‘slow down’ as they get older, but cats or dogs that spend more time sleeping or don’t want to walk very far may have arthritic pain. This is especially true with cats who may spend a lot of their day asleep anyway! Pets can also shift the weight around their four legs making lameness harder to spot. 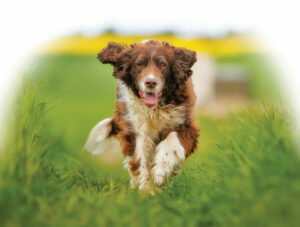 Once treated an arthritic pet can become ‘younger’ again as they are brighter and happier! Often the only way to tell if your pet has arthritis is to put him or her on painkillers and if you see them brightening up and happier then that is the diagnosis! For the month of April we are offering FREE arthritis check ups for your pet as well as 33% off Synoquin Joint supplements. Many older pets may have other conditions so it is essential before setting off on a course of treatment that a full clinical examination is carried out. There are many drugs available (pills, injections and liquids) but also nutraceuticals (such as Synoquin), specially formulated diets, weight control, exercise and laser therapy as well as treating any other problems. We have a physiotherapist, Donna, who comes into the practice, and can help with mobility problems. Don’t let your older pet be uncomfortable, give us a ring for an appointment, we can check them over and advise on treatment options and lifestyle changes if required. https://www.withygrovevets.co.uk/wp-content/uploads/2019/04/Withy-Grove-logo2.png 0 0 Michael Clarke https://www.withygrovevets.co.uk/wp-content/uploads/2019/04/Withy-Grove-logo2.png Michael Clarke2019-03-28 16:46:142019-03-28 16:46:14Could your dog or cat be suffering?